(CNN) -- Slain attorney Chiquita Tate was such a believer in the legal system that she had a tattoo of Lady Justice on her back, college friend T. J. Crawford recalled. Chiquita Tate was in the midde of a high-profile murder trial when she was stabbed to death in her law office. "She just had an attachment to justice and doing what's right by people. She was always very serious about that," said Crawford, a teacher and community organizer in Chicago, Illinois. But Tate, described by colleagues as a tenacious defense attorney who fought for her clients, could not save herself. Family members and friends in Chicago; Atlanta, Georgia, and Tate's adopted home -- tiny Baker, Louisiana -- are reeling from the grisly details of Tate's slaying, and police say it was at the hands of her husband, Greg Harris. They had been married about 14½ months. Harris, 37, is in custody, accused of stabbing Tate to death. He is charged with second-degree murder and the illegal use of a dangerous weapon. A judge last week set his bond at $500,000. In a phone interview with CNN, Harris' attorney, Lewis Unglesby, said police have the wrong man. "Greg Harris by all accounts ... is innocent. I don't know anybody that thinks he did it, except the police," Uglesby said. "There's nothing in his background. He has cooperated completely with the police; he's signed everything they've asked him to sign. He's let them search his house, his car." Tate, 34, had started her own law firm in downtown Baton Rouge, Louisiana, and was doing well, family and acquaintances said. "She was up and coming," said Cpl. L'Jean McKneely, a police spokesman in Baton Rouge. 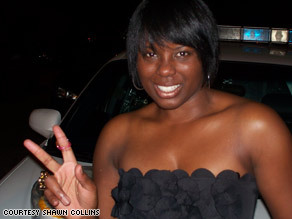 Tate was representing a defendant in a high-profile murder trial when, police say, she became a homicide victim herself. Her body was found inside her law office on February 20. Tate was stabbed 38 times, according to a police warrant for Harris' arrest obtained by CNN. While questioning Harris about Tate's death, police discovered an outstanding warrant for him in connection with a battery-domestic violence case. It stemmed from a December 22, 2007, incident at the couple's home. Harris was accused of using "force and violence" against Tate, according to Baker City Court records. The court said Harris entered a not guilty plea on March 6, 2008, but did not appear for a May 8 pretrial conference. A warrant was issued for his arrest for contempt of court. When Tate met Harris in late 2007, she fell for him, head over heels, said East Baton Rouge Parish Juvenile Court Judge Pam Taylor Johnson, Tate's mentor and former boss. "She came in my office one day: 'I met the most wonderful guy! I need you to perform our marriage -- tomorrow,'" Johnson recalled Tate gleefully telling her. "I told her she had to wait three days," as required by Louisiana law, Johnson added. Tate did wait a bit. The couple's marriage license is dated January 10, 2008, just two and a half weeks after the domestic violence report from Baker police. They married on February 8, their marriage license shows. Only the couple's immediate family members and two friends attended the ceremony at Green Chapel in Baton Rouge, said Tate's friend Shawn Collins, who was one of those on hand for the wedding. Neighbors in suburban Baker said the couple seemed to settle into a good life in their home on Charry Drive. Baker, population 13,000, was one of the cities that absorbed hundreds of families from the FEMA trailer homes after Hurricane Katrina in 2005. The last families housed in Baker moved out last spring. Neighbors recalled seeing Tate frequently driving down the street in her late-model Hummer and Harris steering a Mercedes. Ethan Koobs, who lives across the street from the couple, said Tate was a "really nice lady, very upper-class, presented herself very well." Koobs said he didn't see any discontent in the couple's lives. "They seemed like a pleasant couple, just real nice," said neighbor Don Patton, who lives two houses down. "They kept their house and their lawn very nice." He recalled the couple's concern for their neighbors after Hurricane Gustav, which raked south Louisiana on September 1, 2008, before petering out in southeast Texas. It knocked out power to 1.5 million homes in southern Louisiana, and thousands of homes were damaged by the wind. Harris, a carpenter, found his skills useful. "[Harris] was just generally concerned about everybody's well-being," Patton said. "We'd huddle in the street and he'd ask if anybody needed anything." The couple helped their neighbors rebuild. But the warrant for Harris' arrest in the murder case revealed a fracture in the marriage. Tate was "planning on divorcing the defendant due to marital problems" and had leased her own apartment, the warrant stated. As far as their friends were concerned, there was no trouble in the marriage and Tate appeared to be a doting wife. She also enjoyed battling it out on behalf of her clients in the courtroom. Tate, who was raised with six siblings, was tenacious even as a youngster, recalled childhood friend Ursula Bryant-Hill. "She was always strong-willed and she analyzed everything. Everybody told her 'You'd be a good lawyer,'" said Bryant-Hill, of Hueytown, Alabama. "If you knew Chiquita when she was growing up in Baton Rouge, she was always cautious about who she let in her intimate setting. 'Watch your surroundings,' that's how she was," Bryant-Hill added. Upon graduation from college, Tate worked briefly as a legislative secretary, recording minutes at Atlanta City Council meetings. But she longed to return home to Louisiana to attend law school at Southern University. "When she told me she was in law school, I screamed," Bryant-Hill said. Her friend, Juvenile Court Judge Johnson, said Tate lived by one creed: Justice for all, especially for those more vulnerable in society. "I couldn't get her to accept the fact that 'things happen.' I told her some things you can't change [about the system], but it is our duty to see if we can equalize things," Johnson said. Tate is remembered as someone who fought tirelessly for what she believed in. Now her loved ones hope the legal system will work for her. The days have been long for Tate's family. Asked how she has been coping, Denita Tate, the victim's sister, said, "I'm not. It's harder every day." "We want closure with our family and with our sister, and we want justice," Denita Tate said.